Organised cybercrime is a serious issue for private organisations and government agencies alike. As new technologies emerge, so do new ways to exploit them. Cybercriminals have shifted the way they target organisations, abandoning large-scale, generalised attacks, such as phishing, in favour of more targeted, lucrative techniques with bigger payoffs. Because targeted cybercrime is so profitable, perpetrators are highly motivated to find new ways to gather sensitive data for illicit monetary gain or to give a competitive leg up to governments or companies. In the last several months M86 Security Labs has seen a surge in targeted attacks against organisations for a variety of reasons - whether they are after customer information, intellectual property or simply to monitor a particular email address. This session reviews the methods and tactics used in these recent attacks. We then look at how and why these attacks are successful, even against world leading IT Security organisations, to identify any potential holes in your organisation’s security architecture. • Recent examples of targeted attacks to illustrate common vulnerabilities. Bradley is responsible for Technical Strategy at M86 Security and primary spokesperson for the company on aspects related to the evolution of the technical and strategic product direction beyond the immediate roadmap. In this role he evaluates new technologies and products that could enhance or extend the core M86 product line. 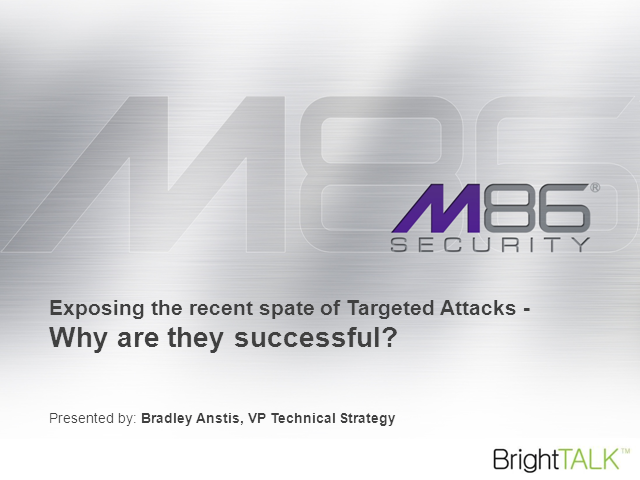 Bradley also serves as the primary spokesperson on all topics relevant to the M86 Security Labs.